Plans to build 800 new homes on the old MG Rover site in Birmingham have been put on hold after a regeneration firm announced half-year losses of £20m. St Modwen Properties said it would develop part of the Longbridge site for commercial use but not sell residential land until the market stabilises. 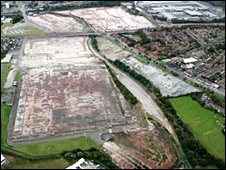 It also said work to build houses on Stoke City's former Victoria Ground would be delayed by about 18 months. Its pre-tax losses of £20m compare with profits of £65.1m a year earlier. The firm said the six months up to 31 May had been "the most difficult for the property industry since 1990". It said: "For residential land, there is currently no genuine market, as the major house builders are unwilling to invest in land until they can see the way ahead more clearly." The firm's chairman Anthony Glossop added: "Victoria Ground, sadly, is likely to remain in its current state for some time until in fact there's a reasonable housing market back again." Victoria Ground has been unused for about a decade after the club moved to the Britannia Stadium. About 250 people living near the site signed a petition last year objecting to plans to turn it into houses, and instead wanted the site turned into a park. Mr Glossop added that work at the old Royal Doulton factory in Nile Street, Burslem, was going ahead and some buildings were soon to be demolished. "That particular site will be seeing significant change over the next six to nine months and we still see activity in that employment area."